Drawing a human face can be a bit challenging. With some simple techniques and rules of thumb you'll soon master the basics of drawing from photos or live models. You'll just need some basic drawing tools and a little bit of patience. Seen from the front the face is basically an oval or upside-down egg shape. As we observe people, however, we realize that very few faces are perfect ovals. Faces actually can be grouped into round, square, inverse triangle (or heart), diamond and oval shapes. 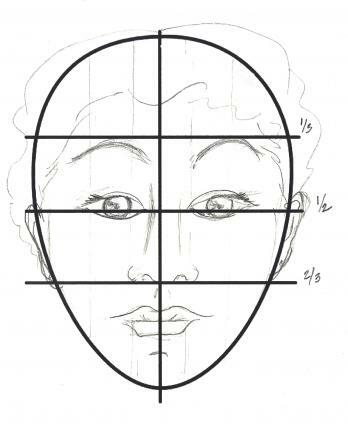 Start your drawing with an oval shape to help you with basic proportions, but then look closely to shape your subject's face. 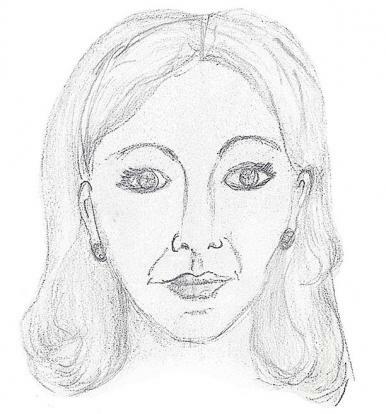 Just as facial shapes vary from the basic oval shape, facial proportions will vary from the proportions suggested here. We all know that some people have wider eyes, longer noses, or smaller mouths than average. Observation is the key to helping your drawing look like the subject. Here are some steps to help you learn to draw an imaginary person with more or less ideal proportions. Draw a light horizontal line half-way down the oval. Now draw a vertical line down the middle of the oval. The vertical line will help you keep the features aligned. Draw a horizontal line approximately one-third of the way down from the top of the oval. This will give you the line for the eyebrows. Draw a horizontal line one-third of the way up from the tip of the chin. This is where you will place the tip of the nose. Sketch in almond shapes for the eyes so the inside corner of the eye will be even with the widest part of the nose, and the outside corner of the eye even with the outer edge of the brow line. Sketch in the nose and lips. The top of the ears should be even with the corners of the eyes, and the bottom of the ears should be even with the tip of the nose. Practice by drawing features on an oval shape on which you have drawn guidelines. This will help you master proportion before you work with a live model or from a photo. You can draw a face from a live model, from a personal photograph, or from a magazine or Internet photo. If you are able to enlarge and print the image from your computer, you can do your initial sketch on top of the photo. Use light strokes when you are doing this first rough sketch. If you are working from a copy of a photo that you can draw on, sketch the general shape of the face and rough in the brows, eyes, nose, mouth, and ears. 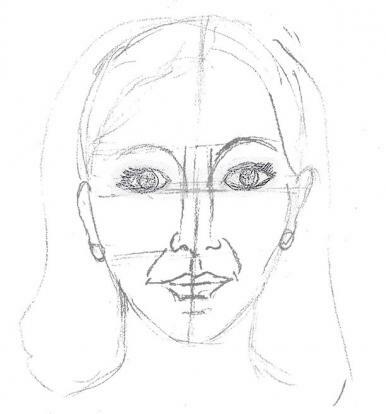 If you are working with a live model, observe the face shape and rough it in on your paper. Lightly add the proportion lines according to the steps above. When you are happy that the face shape and placement of the features resemble your model or the person in the photo, clean up any lines you do not need to finish the drawing. Shape the eyes and draw in lids and eyelashes. Draw in the hairs of the eyebrows along the brow line. Men normally have much heavier eyebrows than do women. 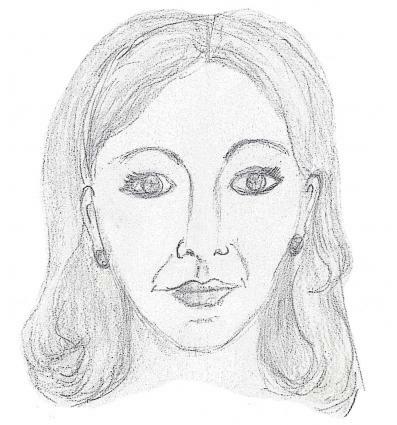 Draw the nose, noting whether the nose is long or short, wide or narrow, and is soft or bony. Draw the nose, suggesting the shape of the nostrils and the tip of the nose with curved lines. Shape the lips. Women usually have fuller lips than do men. Lightly shade the lips, using vertical strokes to define the contours. Shape the cheeks and chin. Does the chin jut out? Is it receding? Shade the features to give the face a three-dimensional feel. Correct details and heighten the contrast in your drawing with shading. Finish by adding color to your drawing if you wish to do so. One way to increase your skill in drawing faces is to use photos or images. If you can scan or copy a photo, you can apply the guidelines mentioned above to the photo to help you get a better likeness. Portrait drawing can be challenging, so it may take quite a bit of practice before you are really satisfied with your drawings. For more techniques and examples of well-drawn faces, pick up the book Secrets to Drawing Realistic Faces. To develop your drawing skill overall, try other items from nature such as flowers, fruit, animals, and landscapes.